Last Saturday (28/11) went to ParenThots Family Day at Bangsar together with Moon & Yan Yan. I know all about this from her and since I'm not join this kind of public event before, I think it is a good chance for me and the boy to explore this fun day. We reached there about 10.30am and thank God the sky was pretty fine when the event starts (in the morning it was quite gloomy, I'm worried if still rain sure we cannot make it). We were there also to give support to Mummy Merryn, her crafty-craft booth was participate in the event to demostrate some art works. Once we reached, we saw Merryn's booth from far with the attractive banners. I came to know Merryn not long ago. This art talented mummy does lots of art works with her 2 years old boy. I'm glad to meet her and her family that day. There are games, free goodies, free food tasting, clowns and inflatables. Terry not really enjoy all this. Basically he not saw all this before and it is totally new to him. He afraid of the 2 colourful clown and kept hiding behind me. When brought him over to bounce at the inflatable house with other kids, he scared again, even Yan Yan keep pulling him in he also don't want to play. Till other kids went off, only by then he got warm up and join in. We went round to play all games that suitable for them like the games like darts, penalty shootout (football), buzz wire, catch a fish, throw rings over the bottles and etc. The boy of cause no patient to queue up and wait. When wanted to play, he just keep waiting beyond the first queue, beside the table and wanted to play immediatedly by pulling my hand to reach out the games for him to play. Of cause I don't do that, luckily he not cried bucket and the booth assistant is kind enough to let this small boy to play. Since he cut queue, I also didn't let the boy to take the allocation time for each games, just let him touch it, play and go. I think I need to teach him what is queue up and wait for your turn things. So far he is still a scary-cat, need me to accompany him to play all games and go everywhere. He was happy when he gets some goodies from the games booth. 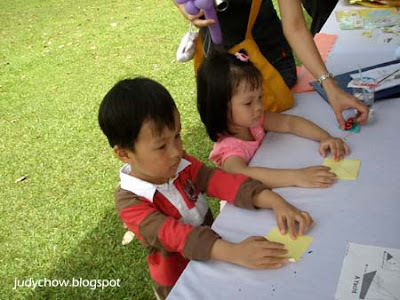 Lastly, we dropped by Merryn's craft booth and she guided the kids to fold Origami. I should bring Sarah to this type of outing and event, she needs it as she is also a scary-cat when comes to new environment and ppl. And she dislike clowns too!